Ever since writer-director Shane Black boarded 20th Century Fox's new film The Predator, the filmmaker has stated that it is not a reboot or a remake, and today we have even more proof that is the case. One of The Predator stars, Jake Busey, revealed in a new interview that his character actually has a connection to the original Predator movies, confirming that it continues the timeline set up in 1987's The Predator and 1990's The Predator 2. This connection is also with his own family, since he plays the son of Peter Keyes, the character his father, Gary Busey, played in Predator 2. The actor made this revelation during an interview with The Red Booth, where he stated that writer-director Shane Black had told him right away that he'd be playing the son of his father's character from Predator 2. In that sequel, Peter Keyes was DEA Special Agent Peter Keyes, in charge of a special task force that was investigating a drug conspiracy. However, this was all a front, covering up his real mission, to track down the killing machine known as the Predator. 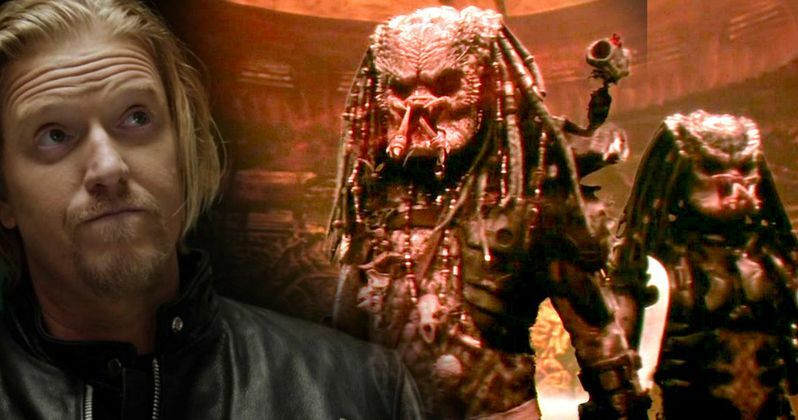 Here's what Jake Busey had to say about this Predator sequel. "Shane Black called me and he said 'Hey, you wanna do this movie? We don't have money for you but it'll be a fun thing to come play and be your father's son.' And so as much as I have followed in my Dad's footsteps career-wise, this is like really following in his footsteps by playing a character who is the son of the character he played. And I don't think there would be any other forum where I would do that. I think this is the one thing." Jake Busey joins a cast that includes Boyd Holbrook, who is said to be the lead character of this movie, although very little is known about any of these characters. Shortly after production started, director Shane Black shared the first photo with Holbrooke alongside Thomas Jane, Trevante Rhodes, Keegan Michael Key and Alfie Allen on the set. The cast is rounded out by Sterling K. Brown, Olivia Munn and Jacob Tremblay, although no details have been given regarding their characters. Jake Busey also added that his character seemingly didn't follow in his father's law enforcement footsteps, revealing his profession. Here's what he had to say below. "We shot it up in Vancouver, and they were there doing it for about three or four months, but I was up there for three weeks. I play a scientist in the film, and I'm very excited about it. I think it's going to be great. If you liked the very first movie a lot, you'll really like this one. This one has a lot of essence of the first movie." The Predator wrapped shooting in early June, and with the new August 3, 2018 release date, pushed up several months from February 9, 2018, director Shane Black now has over a full year to work on post-production. There haven't been any further updates since filming wrapped, and it isn't clear when the first trailer may arrive, now that the summer 20818 release date has been set. As of now, The Predator will face Warner Bros.' Holmes & Watson, Lionsgate's Tyler Perry's A Madea Family Funeral and an unspecified Disney live-action fairy tale project. Take a look at Jake Busey's interview below, where he discusses The Predator and much more.